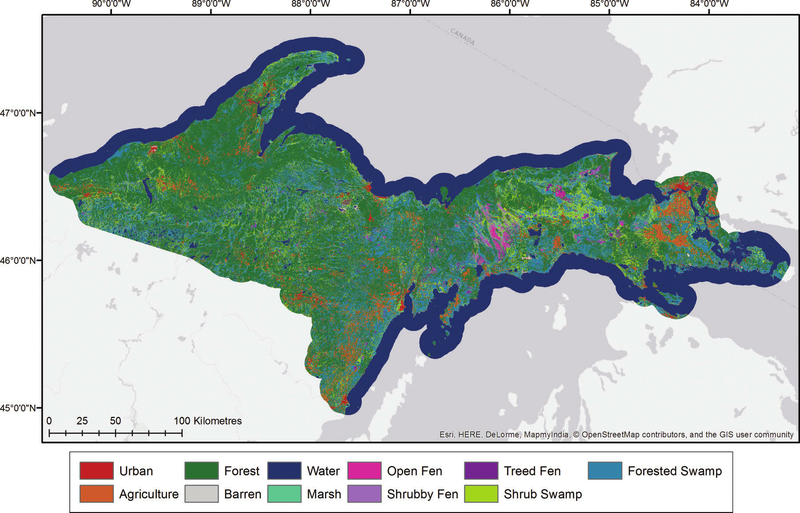 This dataset provides a land cover map focused on peatland ecosystems in the upper peninsula of Michigan. The map was produced at 12.5-m resolution using a multi-sensor fusion (optical and L-band SAR) approach with imagery from Landsat-5 TM and ALOS PALSAR collected between 2007 and 2011. A random forest classifier trained with polygons delineated from field data and aerial photography was used to determine pixel classes. Accuracy assessment based on field-sampled sites show high overall map accuracy (92%). Peatlands represent a diversity of ecosystem types that vary considerably in vegetation structure, hydrology, composition, and peat depth. This type of mapping effort provides the spatially explicit information needed to allow for monitoring and assessment of these important carbon-rich ecosystems. This dataset contains one file in GeoTIFF (*.tif) format and one compressed shapefile (*.zip). Figure 1. Peatland type map for the upper peninsula of Michigan (from Bourgeau-Chavez et al. 2017). The North American Carbon Program (NACP) is a multidisciplinary research program to obtain scientific understanding of North America's carbon sources and sinks and of changes in carbon stocks needed to meet societal concerns and to provide tools for decision makers. The NACP is supported by a number of different federal agencies. The central objective is to measure and understand the sources and sinks of Carbon Dioxide (CO2), Methane (CH4), and Carbon Monoxide (CO) in North America and in adjacent ocean regions. This study was funded by NASA North American Carbon Program (Grant number: NNX14AF96G). There is one peatland land cover map (peatland_landcover_michigan_up.tif) in GeoTIFF format included in this dataset one shapefile (compressed in landsat_palsar_scenes_dates.zip). Spatial reference information and additional information for the GeoTIFF file are provided below. The peatland land cover classes and descriptions are listed in Table 1. An error matrix (Figure 2) giving the classification accuracy for the land cover map is included as a companion file in PDF format (peatland_landcover_michigan_up_error.pdf). Table 1. Land cover classes and descriptions for peatland_landcover_michigan_up.tif. Peatland land cover types in bold. Primarily residential areas where man-made structure (i.e. buildings, farm equipment) are present; with more than or equal 25% vegetation (trees, shrubs, grass) are interspersed. Lawns, golf courses, athletic fields, urban parks and mowed transitional zones such as medians or airfields. Linear transportation routes, large driveways, and parking areas. Transportation routes can include highways, small two lane roads, rail road beds, airfield landing areas, round-a-bouts, parking lots, and off and on ramps. Hay fields and croplands where row crops such as corn, beans, and grains are in production. Land used for production of food or fiber; land use distinguishes agriculture land from similar natural ecosystem types (i.e. wetlands and rice patties). Agriculture fields not in row crop production, such as areas of native grasses or meadows and pastures. Orchards, vineyards, and ornamental plants/trees. Broad leaf and needle leaf deciduous and evergreen trees and dead forests. Characterized by woody vegetation with a height > 6m. Crown closure percentage (i.e. aerial view) > 75%. Needle leaved deciduous and evergreen trees with distinct row structure and typically planted in defined geometric plot. Crown closure percentage (i.e. aerial view) > 75%. True shrubs, immature trees, or stunted growth trees/shrubs. Characterized by woody vegetation with a height < 6m. May represent a successional stage growth that has not yet matured to forest, or stable communities of shrubs and stunted growth trees. Crown closure percentage (i.e. aerial view) > 50%. Salt flats, beaches, sandy areas, bare rock, strip mines, quarries, gravel pits and transitional area (on gray scale > 50% white). Land with limited ability to support life. Contains less than 33% vegetative cover. May include thinly dispersed scrubby vegetation. Salt flats, beaches, sandy areas, bare rock, strip mines, quarries, gravel pits and transitional area (on gray scale ≥ 50% black). Land with limited ability to support life. Contains less than 33% vegetative cover. May include thinly dispersed scrubby vegetation. Streams, canals, rivers, lakes, estuaries, reservoirs, impoundments, and bays. Areas persistently inundated in water that do not typically show annual drying out or vegetation growth at or above the water’s surface. Where depth of water column is > 2m, such that light attenuation increases significantly and surface and subsurface aquatic vegetation persistence declines or is less detectable. Algal beds, aquatic mosses, rooted vascular plants (e.g. eel grasses and sea grasses, pond weeds, lily pads, milfoil) and floating vascular plants (e.g. lemna, water hyacinth, coontails, and bladderwarts). Inundated wetlands or water < 2m (excluding deep water zones) habitats dominated by plants that grow principally on or just below the water’s surface. Emergent wetland and wet meadow vegetation not represented by other classes. These are areas where the water table is at or near the earth’s surface. Seasonal inundation and or drying are common phenomenon. Vegetative species distributions are strong indicators of wetland condition. Does not include cultivated wetlands, such as rice paddy or cranberry farms. Dominate species is Schoenoplectus spp. and crown closure percentage (i.e. aerial view) > 50%. Dominate species is Typha spp. and crown closure percentage (i.e. aerial view) > 50%. Dominate species is Phragmites australis and crown closure percentage (i.e. aerial view) > 50%. Brown and graminoid moss dominated with > 30cm peat. Connected ground and surface water flow; minerotrophic. Crown closure percentage (i.e. aerial view) > 75%. Brown and graminoid moss dominated with > 30cm peat. Connected ground and surface water flow; minerotrophic. May represent a successional stage growth that has not yet matured to forest, or stable communities of shrubs and stunted growth trees. Crown closure percentage (i.e. aerial view) > 50%. Brown and graminoid moss dominated with > 30cm peat. Connected ground and surface water flow; minerotrophic. Characterized by woody vegetation with a height > 2m. May represent a successional stage growth that has not yet matured to forest, or stable communities of shrubs and stunted growth trees. Crown closure percentage (i.e. aerial view) > 75%. Wetlands dominated by shrubs < 6m in height. Crown closure percentage (i.e. aerial view) > 50%. Wetlands dominated by woody vegetation (dead or alive) > 6m in height. Includes seasonally flooded forests. Crown closure percentage (i.e. aerial view) > 50%. A shapefile (landsat_palsar_scenes_dates.shp) listing the Landsat and PALSAR scenes used to produce the land cover map is also included (compressed in landsat_palsar_scenes_dates.zip). Shapefile attribute names and descriptions are listed in Table 2. This dataset is the product of a multi-sensor, multi-season remote sensing approach to delineate boreal peatland types (wooded bog, open fen, shrubby fen, treed fen). Climate change predictions estimate that the boreal and arctic regions will be the most strongly affected by projected rising temperatures and changes in precipitation patterns. The ability to distinguish and monitor various peatland types at the landscape scale has implications for inventory, conservation, carbon storage estimation, fuel loading, carbon emissions, hydrology, and monitoring ecological shifts in a changing climate. Training polygons equal to approximately 20% of the total polygon area of each class were withheld from the classification and used for validation of the peatland type map. The accuracy assessment included producer’s accuracy, a measure of how accurately the analyst classified the image data (errors of omission = 100 – producer’s accuracy), and user’s accuracy, a measure of accuracy of the classification performed in the field (errors of commission = 100 – user’s accuracy). The error matrix in Figure 2 (Bourgeau-Chavez et al. 2017) indicates an overall map accuracy of 94%. Similar classes were combined for readability; e.g. "barren light" and "barren dark" classes were combined into the "barren" class. The complete error matrix including all land cover classes indicates an overall map accuracy of 92% and is provided as a companion file (peatland_landcover_michigan_up_error.pdf). Figure 2. Peatland land cover map error matrix; numbers represent pixel counts (Bourgeau-Chavez et al. 2017). Land cover was classified for the upper peninsula (UP) of Michigan using a multi-sensor fusion (optical and L-band SAR) approach. A random forest (RF) classifier was used to generate a group of independent classification trees and pixel classes were determined by a majority vote of the trees. Training data were produced using field data and aerial photo interpretation. Field characterization was performed for training and validation of the random forest classifier. Field data were collected at the minimum mapping unit (0.2 ha) at sites in each of the study areas. Aerial imagery was used to narrow the field locations to areas that appeared to be potential wetland sites. 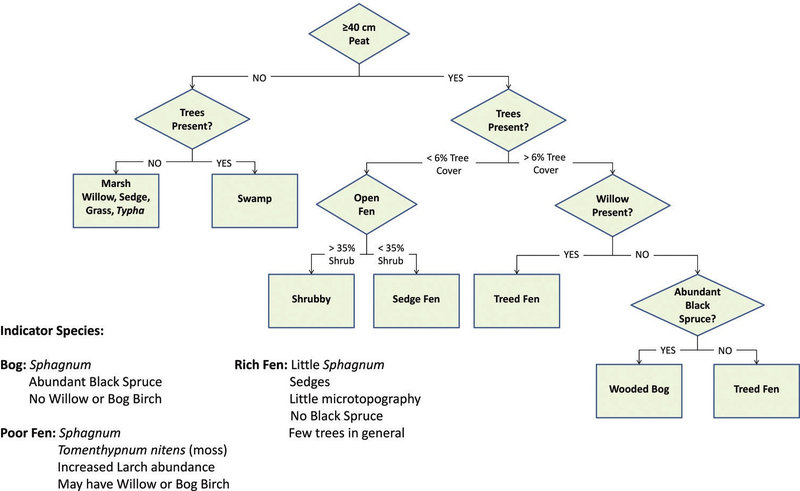 Wetland ecosystem type was determined using the field classification key depicted in Figure 3. Datasets for multiple dates from Landsat-5 Thematic Mapper (USGS) and ALOS PALSAR (Advanced Land Observing Satellite; Phased Array type L-band Synthetic Aperture Radar; JAXA; Alaska Satellite Facility) were acquired for classification. Landsat data were converted from radiance to top-of-atmosphere reflectance (Chandler et al. 2009). SAR calibration to backscatter coefficient, terrain correction, and geolocation were applied using the Alaska Satellite Facility’s MapReady software program. A second-order polynomial was used to geocorrect all SAR data to within 1 pixel of the reference Landsat data. All data were resampled to 12.5-m resolution and stacked into a single file containing each band from each image date. Classification was performed using a RF classifier. The satellite data from Landsat and PALSAR were merged to create a map of the 4.24-million-hectare peninsula. Training and validation polygons were interpreted by an image analyst using field data and aerial photos from the National Agriculture Imagery Program. The amount of training data per class was proportional to the area of that class for each region. The algorithm was set to generate 500 decision trees for each classification run. The number of variables used to split each node was approximately equal to the square root of the total number of variables in that scene. A diagram of the classification workflow is depicted in Figure 4. The map produced using the RF classifier was compared to a similar map resulting from object-based image classification and determined to have the higher overall accuracy (Bourgeau-Chavez et al. 2017). Figure 4. 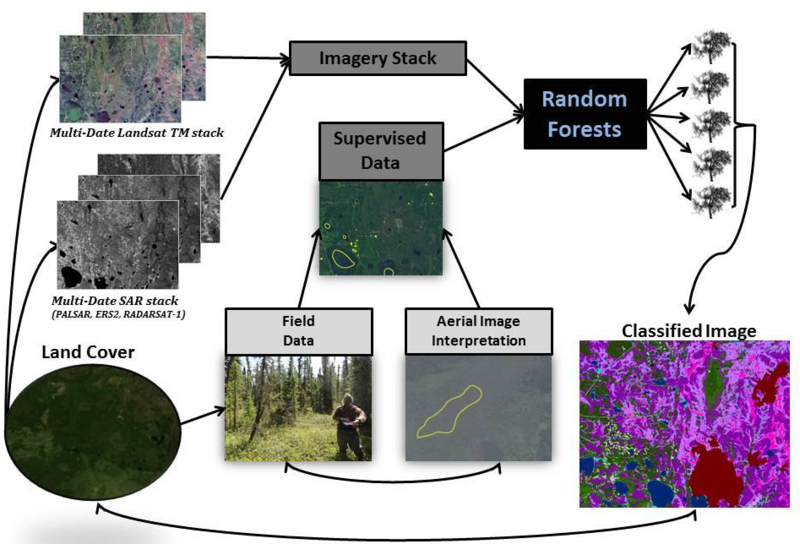 Classification schematic showing the mapping methodology using field data, aerial photography, and satellite imagery (from Bourgeau-Chavez 2015). Bourgeau-Chavez, L.L., N.H.F. French, E.S. Kasischke, M.R. Turetsky, L.K. Jenkins, S. Endres, E. Banda, M. Billmire, and B. de Groot. 2015. Vulnerability of North American Boreal Peatlands to Interactions between Climate, Hydrology, and Wildfires. Poster presented at NACP Principle Investigators Meeting 5, Jan 26-29, 2015.